Hi, I’m Vasilis Kyritsis and I’m the co-founder of The Clumsies in Athens. Bartending is a job about love and that’s what I like, to share love with others. I began in clubs to earn money during my studies in nursing 14 years ago, that’s when I realised that bartending was a real job with huge potential. I travelled to various places to learn about different flavours, like the Drink Factory with Tony C. in London. 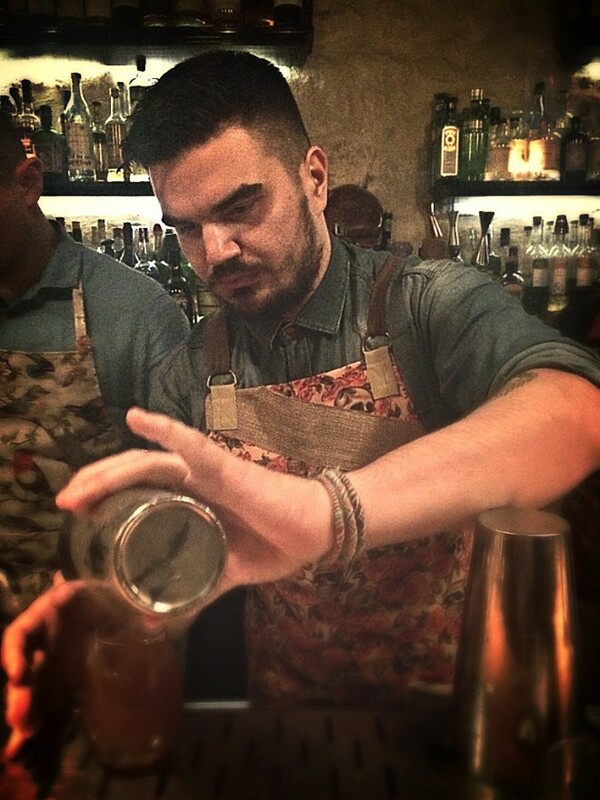 I also participated in seminars to improve my skills, started working in small bars that I felt were more professional and created well balanced drinks for my customers. I did all this over the course of the last seven years and last year we opened The Clumsies. 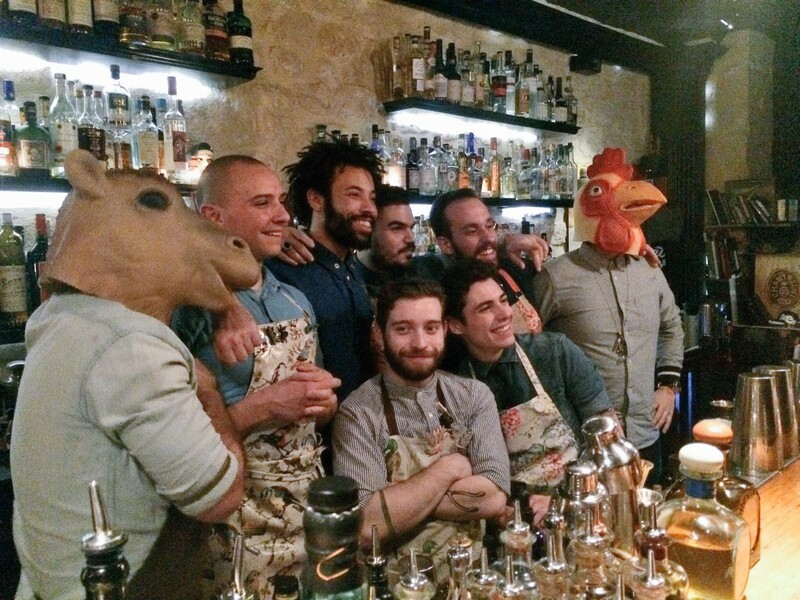 This interview was made during a guest bartending session at Little Red Door in Paris. So, it’s ‘little bit’ noisy and bumpy. But at least you can feel the ambiance and the fun (featuring Sullivan Doh, Remy Savage ad Nikos Bakoulis). The Clumsies is the bar of my dreams. It’s an all day bar. In the morning we serve coffee, for lunch casual dining from a Michelin star chef and in the evening cocktails and finger food. It’s a big bar in a big house with two floors. On the first floor it’s a small volume bar dedicated to quality drinks where only 10 people can sit per night. Each customer has a personal bartender and you can smoke cigars whilst listening to jazz and swing music. The other floor is really adapted to greek customers where you can dance to funky music, speak loudly and it’s a high volume bar, where we can serve 300 people at the same time. It’s like an urban house with different rooms. We also have also a small lab where the team can work on the drinks. When I go out, it really depends on my mood where I go and what I do, but I do like to try other cocktail bars. Vodka is my favourite spirit. It’s a neutral spirit which you can work on, like a canvas for painting. You can create the flavour you want step by step, layer by layer and make the exact cocktail you imagined. First of all the smile of the bartender, because if they don’t smile they will never like the cocktail they make or be inspired by the flavours. I also think it’s how you mix all the ingredients in the glass and then the garnish. For instance, I am inspired by fashion and art… last week a dress I saw inspired my garnish. I love to work with traditional Greek herbs and roots like mastic, greek fennel and a local lemon plant. In Greece you have a lot of fresh local ingredients like herbs, fruit and vegetables to create flavors with. I think you should go to White Lyan and 69 Colebrook Row in London, Maison Première in Brooklyn NCY, Central Station in Beirut. Thank you Little Red Door for this crazy night!! !